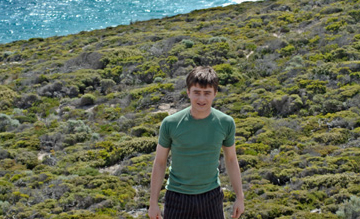 Warner Bros Independent Pictures has nearly a dozen new pics from Dan Radcliffe’s film December Boys. You can see a few below and view all the pics here in our gallery. Thanks to DR.co.uk for letting us know! Last edited by Hecate; 05-30-2007 at 05:19 PM. Cool pictures! Dan is so cute. Dan looks good. I wanna hear his Australian accent. whoo!!!! Dan is lookin good as always!! Gorgeous! Simply Gorgeous is how i would describe our dan! Cute pics!!! It's so nice to see dan in another role besides Harry. I hope the movie is good! Cute pic, but I don't like the blondie, what is she doing to my Dan????? It'll be nice to see him as someone other than Harry (movie-wise). I know I'm going to see that movie! Last edited by MalfoyzBeloved; 05-30-2007 at 09:53 PM. Location: Deep in the Heart of Texas. and thanks to britishgrl09 for the awesome siggy and avvie!!! Have you ever seen anyone so hot in a plain green t-shirt????? The more pictures of this movie I see, the more I want to see it. haha the peering into the window pic is funny. Dan looks akward between all those kids! !